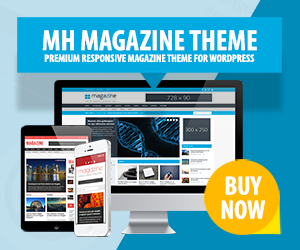 A few days ago we released a major update for our highly popular MH Magazine WordPress Theme. The new version of MH Magazine includes a lot of additional features, options and custom widgets to create nice and appealing online magazines, dynamic news websites or professional blogs. MH Magazine is ideal if you want to take your existing online magazine, news website or blog to the next level and display a lot of dynamic and well organized content on your front page by just placing a few widgets in your WordPress dashboard. Thousands of existing users already trust this flexible and reliable magazine theme for WordPress to create and manage awesome editorial websites. In the past we released a video tutorial for MH Magazine which seemed to be very helpful for some users, especially for users who are not familiar with the English language. The old video now is outdated because the theme has been heavily improved in the meantime and contains many new features that aren't covered in the previous video. To help you get started with the latest version of the MH Magazine theme (v3.0.0), we've published a new extensive video tutorial which covers most aspects of installing and configuring this popular magazine theme for WordPress. In addition to the new video tutorial for MH Magazine, we've also updated the theme documentation to cover the new features of the theme. By following the instructions in the documentation, you can easily install and configure the MH Magazine theme through your WordPress dashboard and make your site look like our theme demos. What if you need additional assistance? Especially if you are not yet familiar with WordPress, you might have additional questions that aren't covered by the theme documentation or the video tutorial for MH Magazine. You might find answers to your questions in our support center where we've published several WordPress tutorials, answers to frequently asked questions or else. If you've purchased a premium WordPress theme by MH Themes, you can also use our premium support forums where you can ask all kinds of theme related questions and also quickly find help through thousands of previously answered questions from other users. In case you have questions that haven't been answered yet, simply open new threads regarding your questions in the forums and our support staff will be more than happy to assist.